An academic from University of Wolverhampton has formally received an MBE from His Royal Highness Prince Charles, Prince of Wales, at Buckingham Palace. 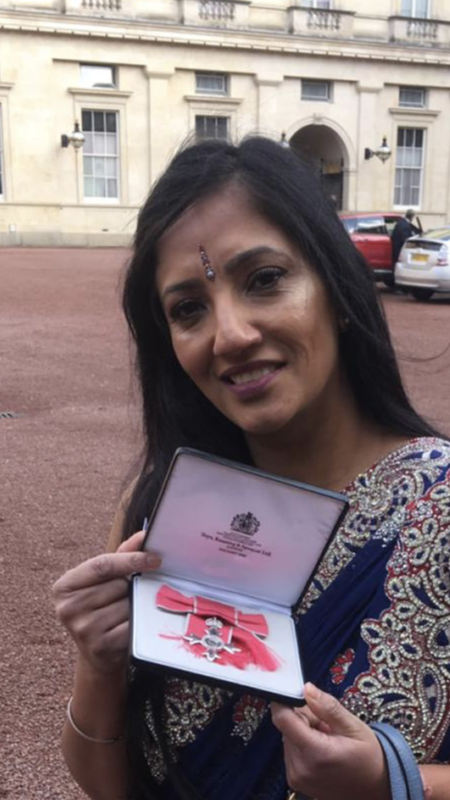 Dr Opinderjit Kaur Takhar, Director of the recently launched Centre for Sikh and Panjabi Studies at the University and Senior Lecturer in Religious Studies in the Faculty of Arts, was awarded the Member of the Most Excellent Order of the British Empire (MBE) in the New Year Honours list. The New Year Honours list recognises the achievements of a wide range of extraordinary people across the UK. An MBE is an award given by the Queen to an individual for outstanding service to the community or local 'hands on' service. Dr Takhar, from Derby, undertakes a variety of research, specialising in subject matter that relates to the Sikh community as well as topics including caste and gender balance. She is well-known in the region for her research work – especially in the Sikh community in and around the West Midlands. A Fellow of the Higher Education Academy, Dr Takhar is also an Editorial Board member for Journal for Religions of South Asia in Canada, on the editorial board of the Journal, Sikh Formations, she sits on the Steering Committee of Special Interest Group on Teaching Religions of South Asia and is a Board Member of the Inter faith Wolverhampton Network. Dr Takhar has presented her research in Universities across the world, she has produced textbooks and a Teacher’s guide for the OCR GCSE syllabus on Philosophy and Ethics, used in secondary schools across Britain and she has written numerous educational resources for RE Today Publications, a national resource for teaching Religious Education across schools and colleges in the UK. Her 2005 book on Sikh Identity is used as a key text in Universities across the world. She is a regular participant on discussion programmes and panels on Sikh media channels. She has regularly contributed to the British Sikh Report, as well as the UK Sikh Survey, and is also one of the authors of the Sikh Manifesto, produced by the Sikh Network (UK) in preparation for the 2015 British Parliament elections. Dr Takhar said: “I am absolutely thrilled and humbled to have received such a prestigious award at Buckingham Palace. I am committed to bringing faith communities together whilst at the same time raising the profile of the Sikh community. Professor Geoff Layer, Vice-Chancellor at the University of Wolverhampton, said: “On behalf of everyone at the University of Wolverhampton, I would like to congratulate Opinderjit on this prestigious and very well deserved honour. “Engaging tirelessly with local, regional, national and international community groups and governing bodies, Dr Takhar is consistently raising awareness of issues that affect the Sikh community in the UK and abroad. The University of Wolverhampton launched its new Centre for Sikh and Panjabi Studies earlier this year - the first of its kind in the UK - and is one of the first Universities in the country to offer a Master’s Degree in Punjabi Studies. The Centre will offer PhDs and Master’s level courses in Sikh studies, as well as continuing professional development (CPD) courses for teachers and managers of diverse workforces such as national and local government, the NHS and the emergency services.